To increase capacity and resiliency in our North Atlantic systems, we’re working with Facebook, Aqua Comms and Bulk Infrastructure to build a direct submarine cable system connecting the U.S. to Denmark and Ireland. This cable, called Havfrue (Danish for “mermaid”), will be built by TE SubCom and is expected to come online by the end of 2019. Projected trench of the Havfrue cable as illustrated by cloud.google.com. Projected trench of the Havfrue cable as illustrated by TE SubCom. 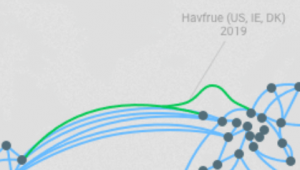 Projected trench of the Havfrue cable as illustrated by submarinecablemap.com. The Havfrue system will consist of three segments. (1) The Main Trunk will connect the existing cable landing station at Wall, New Jersey with a new cable landing station to be constructed at Blaabjerg, Denmark. (2) The Ireland Branch will connect a new cable landing station to be constructed at Old Head Beach, Leckanvy, Ireland with a branching unit on the Main Trunk. (3) The Norway Branch will connect a new cable landing station at Kristiansand, Norway with a branching unit on the Main Trunk. Ownership of the Blaabjerg landing station will be jointly between the above via the corporations America Europe Connect 2 Denmark ApS (for AEC2) and Edge Denmark (for Facebook) but it will be operated by AEC2. As a spin off of Aqua Comms’ involvment in the Havfrue system they are also connecting Esbjerg to the UK via a new cabled dubbed North Sea Connect. Google is currently also projecting its own private subsea cables, some of the rationale behind their mixed private/consortium/lease approach are disclosed in blog post from 2018-07-17 announcing the Dunant cable, which is the first Google private transatlantic subsea cable projected to connect Virginia Beach and France. Terminal Stations Locations: New Jersey (USA), Jutland Peninsula (Denmark) and County Mayo (Ireland). Optional branch extensions to Northern and Southern Norway are also included. The NKT Victoria cable laying vessel spotted in Esbjerg Harbour in October might have some business to do in connection with Havfrue. Taking a deeper look into the meta data of the document containing the Environmental Assessment (Danish: “miljøvurdering” shortened “MV”) and Environmental Impact Assessment (Danish: “miljøkonsekvensvurdering” or “vurdering af virkningerne på miljøet” shortened “VVM”) of the announced data center in Esbjerg reveals an interesting embedded title of the document which has not been carried out into other publicly used references. The embedded PDF title of the document uses the “Project Ember” term which has not been indicated by other sources than articles in the JydskeVestkysten newspaper. The paper cite municipal sources but the municipality has not used the name directly in any of their communications. The local media of Western Jutland, JydskeVestkysten, has spearheaded the coverage of an interesting technology related story over the last weeks. The Esbjerg municipality planning departments has started to reveal details of the preparations for the development of an industrial site on a large swath of land just outside of Esbjerg seemingly for the purpose of a hyperscale data center of the proportions employed by FANG sized (Facebook, Amazon, Netflix, Google) organizations. According to the media the project is by some municipal sources referred to as “Project Ember“. I have been unable to confirm this name from official documentation yet released or any other sources. Neither the newly formed trade association named Danish Data Center Industry (DDI/DanishDCI) (in Danish: “Datacenter Industrien“) or the state’s Invest in Denmark office has brought any more light to the issue. The former has, however, tweeted a couple of times about it when it hit the national media and the latter has brought forward a vague hint that Western Denmark is an “attractive data centre hub“. I’m not in any doubt that this is partly driven by the announcement of the “HAVFRUE consortium“, which includes Facebook, that they intend to install a 108 Tb/s transatlantic cable crossing from New Jersey to Ireland and Esbjerg, as also announced by Invest in Denmark in January. Below is an outline of the area in question (on an OpenStreetMap based map using the umap project) that I have drawn from the only geographical details yet leaked which is contained in the meeting agenda mentioned below. See also a visualisation of the area on a photo taken by local photographer Christer Holte. I have collected links to all official documentation I have been able to locate and to press coverage below, and intend to keep updating this post as details is being revealed. 2018-10-11: Sydvestjyske Museer (Museum of Southwest Jutland) has released an article about their preliminary findings (Google Translate’d) of the excavations done in the area.